Nakahira, Takanashi & Taki, Provoke 1, Provoke-sha, 1968, pp.36-37 (fig.1); this print reproduced in Takanashi, Toshi e, self-published, 1974, pl.8; Photography and The National Museum of Modern Art, Tokyo 1953-1995, The National Musem of Modern Art, Tokyo, 1995, p.57, pl.67; Takanashi Yutaka: Nihon no shashinka 35 [Japanese Photographers, Vol.35], Iwanami Shoten, 1998, pl.16. 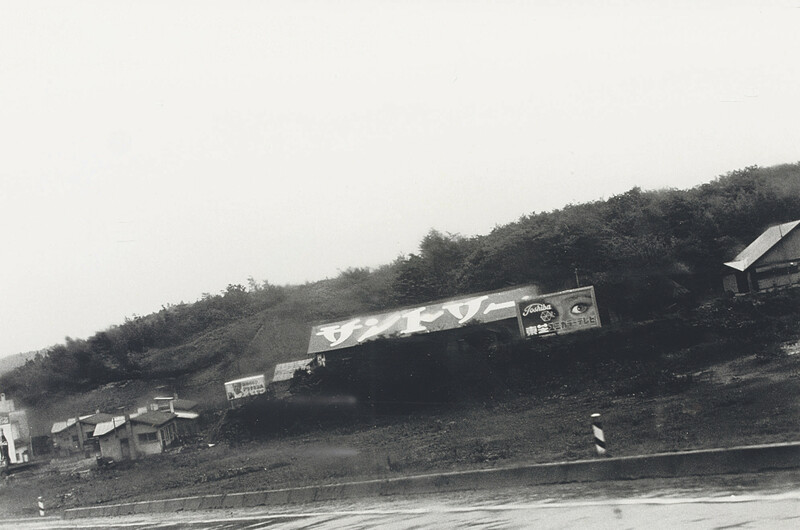 This is the actual photograph reproduced in Takanashi's defining book Towards the City (1974) and was gifted by Takanashi to his assistant at that time. The present lot is the only print Takanashi made of this image in the year it was shot. This striking photograph, first published in Provoke 1 (1968), was taken by Takanashi probably out of his car window while driving on a highway. Central to the image are the billboards which represent three leading Japanese companies in the respective industries of electronics, alcohol and pharmaceuticals. The sign on the right is advertising Toshiba's new colour television. 1968, the year this picture was taken, marked the peak in the fierce competition among TV manufacturers as a result of the standardisation of colour programming. The sign in the centre simply reads 'Suntory', the brewing and distilling company, and the one on its left is for Takeda Pharmaceutical Company's signature product 'Alinamin A', a vitamin supplement. For Takanashi, the billboards signify Japan's rapidly expanding cities and a lifestyle increasingly based on commodity and consumption.